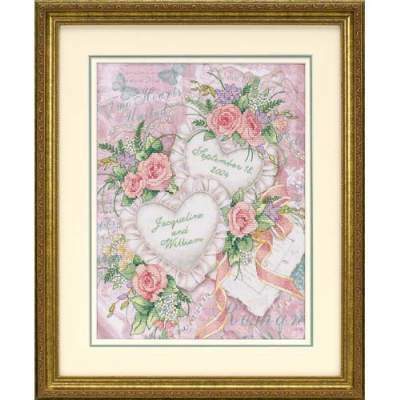 **Stamped Cross Stitch** Give the happy couple an elegant wedding gift. This kit includes an alphabet for personalizing your gift, and the full-color printed fabric creates a stunning background for your stitches. Designed by Mellisa Edmonds; full kit from Dimensions. Finished size is 11" x 14".